The Vermont Go Club meets on Wednesday evenings from 6:00 p.m. to 9:00 p.m. at the Onion River Food Co-op (South End), 75 Briggs St., Burlington, VT.
Do note that there is a handicap division as well open to all comers, not just competitors for the state championship! Round 1 – 9:45 A.M. Round 2 – 1:00 P.M. Round 3 – 3:15 P.M. The Vermont Fall Go Tournament will be held at the same time for all other players and for those dropping out of the Vermont Go Championship. This will be a three-round AGA-rated handicap go tournament with the same fees and rules as shown above. The Vermont Fall Go Tournament is open to all players with current AGA memberships. Please renew ahead of time if needed. Thank you! Our long beloved meeting place, Uncommon Grounds cafe downtown unfortunately has changed their hours to end business at 6pm. This has required us to find a new place to meet and play Go. We are now meeting at the (new) Onion River Co-op location in the south end of Burlington, at the same Wednesday evenings from 6:00-9:00pm. See you there! Club member Max Ekstrom and his daughter Celia are hosting a children's Go club at the Essex Library. Starting November 6th 2017, they will be teaching and playing Go on Mondays from 5:30pm-6:30pm. A great opportunity for young folks to learn and enjoy the game! Go players from Vermont, New York, and Montreal gathered together for four rounds of fun at the Everything Must Go Tournament lastSaturday, September 30th in Middlebury, Vermont, reports Peter Schumer. The top three players all went 3-1, with Robert Ursiny 4k (right) winning the tournament. Second place went to Remi Compagnie 7d (left), with Peter Schumer 2k coming in third. True to the tournament’s name, everyone received a prize from a collection of books, magazines, fans and mugs. Long time Vermont Go Club member and founder Peter Schumer is hosting a tournament in Middlebury, VT on September 30th! The games will be held in Warner Hall (room 506) on Middlebury College campus (the "usual" place.) Registration begins at 9:30 and Peter hopes to get things up and running quickly so that there will be four rounds of play. Please update your AGA memberships in order for the games to count for AGA rating purposes. If you are not an AGA member currently, you are encouraged to join, but non-AGA members will be accomodated! Members of the Vermont Go Club manned the Go demonstration booth at this year's Matsuri! Many games were played and taught on 9 X 9 boards. Always a fun time! Thanks to all who taught and learned! Unfortunately for the Go Club, Takuma is returning to Japan and won't be playing with us again for the foreseeable future. Gil was kind enough to host a going away party - much good food and libations were enjoyed by all as well exciting Go play! Best of luck to Takuma! In an exciting match, Lee Sedol will be playing the new best computer Go player, Alpha GO. Alpha Go has already defeated a European pro level player. Is this the end of the dominance of humanity in Go? Pete Schumer, David Felcan and Kim Villemaire from the Vermont Go Club give an overview and introduction to the game on local television. Everything you could want to know about the game if you've never played it in 45 minutes! Thanks to Kim Villemaire and Chittenden County TV for making this possible! 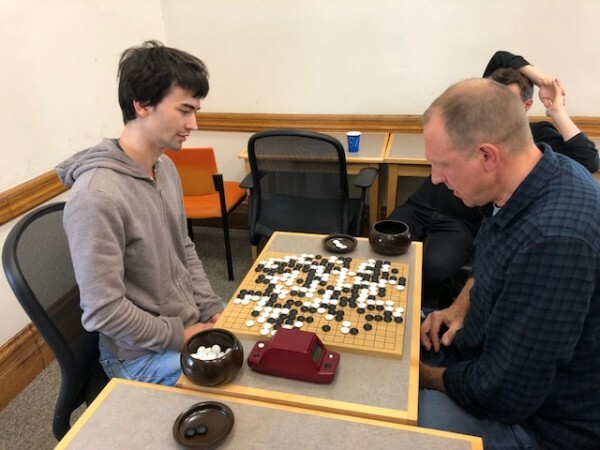 Recently (on 11/7) a Go Tournament was held in Middlebury. Vermont Go Club member Brandon Tries took first place! Congratulations Brandon! Also, some of our members are playing in the Pandanet City League (http://pandanet-igs.com/communities/agacityleague) which is a nation-wide online tournament with games monthly. A You Tuber, known as xhu98 has created a video running commentary of the recent games that were played in October 2015. Featured there are our own Quan wei (qwei33) and Rich Chalmers (shauke) duking it out with members of the Atlanta 1 team. The Japan Society of Vermont is hosting a Matsuri (Spring Cherry Blossom festival) at St. Michael's College. We will be there, teaching people Go and doing demo games. Come check it out! The ECHO center here in Burlington is hosting a board games exhibit. ECHO is a children's museum and nature center. We spoke with them and produced a Go section for them to put up. Dave spent some time there showing patrons the Capture Game. Pete will be hosting a Go tournament at Middlebury College on Saturday, January 24th, 2015. It will be held in Warner Hall room 506 (the usual venue) with registration starting at 9:30 A.M. sharp. We hope to complete two rounds in the morning and two in the afternoon. I hope you can join us! In the meantime, please verify that your AGA membership is up to date (and if not, please renew it beforehand.) The tournament registration fee will be $10 and I'll make sure we have some nice prizes for the top finishers. 11/30/2014 - Three Dragons Emerge from the River Go Tournament is Done! About 10 folks played. Edward Lin 7d was the winner. Congratulations Edward! 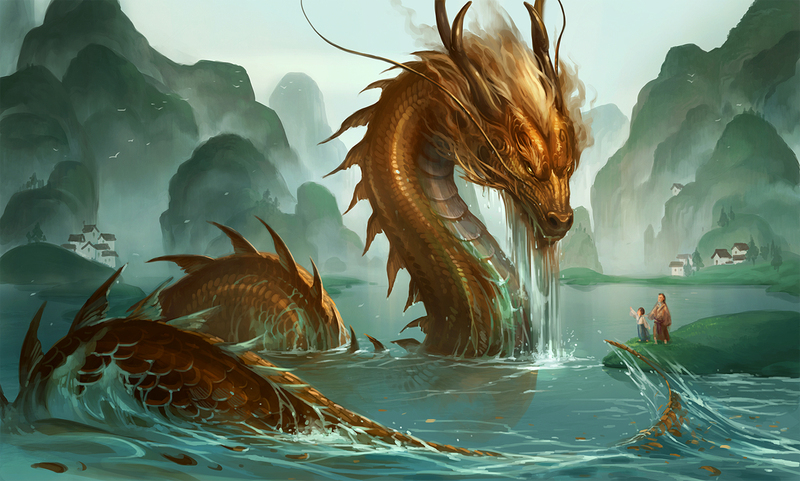 11/01/2014 - Three Dragons Emerge from the River Go Tournament! This will be held at the Fletcher Free Library (in Burlington, VT) on Sunday November 9th, from noon - 6pm. Format will be 3 rounds of 40 minutes, 5 periods of 30 seconds byo-yomi. All are welcome, please come! Queen City Go Tourney Spring 2014 - Concluded, Goes International! A fun time was had by all, of course! This tournament saw four players from Canada come down to play with us Americans! So it became a bit of a USA vs. Canada tourney, to which I have to say kudos to the Canadians! The Vermont Go Club is hosting a tournament! It will take place at The Fletcher Free Library on March 16th (Sunday), registration to begin at noon, with games commencing around 12:30. All are welcome! Come and have a great time!